New from JT Stitches....Moo Holder keychains! This is the first of many moo to come (I just had to). These cutie pies are 2" X 3" & could hold about 15-20 cards. They are made with cotton fabric & heavy interfacing to give it shape so your cards won't get all bent up. 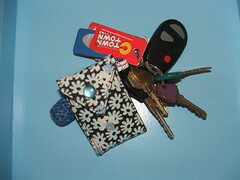 The Moo holders can be made with a snap, button or velcro closure. You can attach them anywhere you want with the small, light weight hook. I have much more FABRIC HERE to choose from--if you see a pattern you like let me know. I will also be adding more to my Etsy Shop!